Find here free math videos on percent-related topics: what is percent, percentage of a number, discouns, sales tax, and percent of change. These videos are meant equally for students, teachers, and parents. 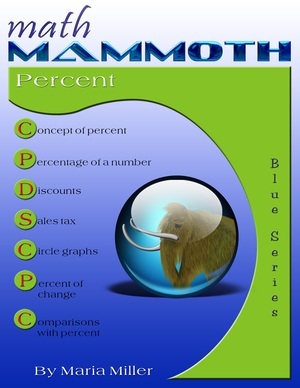 The videos match the lessons in my book Math Mammoth Percent (Blue Series book), or the lessons in chapter 5 of Grade 6-A (Light Blue series), or chapter 7 in Grade 7-B (Light Blue series). In any of those books, you will get MANY more practice exercises, word problems, and puzzles than what are shown in the videos, and also some lessons that are not in covered in this set of videos. What is percent? I show how to change percents to fractions and vice versa. Find how to solve various percentages (percent of a number or quantity) using mental math. First, find 1% or 10% of the number, then you can find any percentage of the number. I show how to find a percentage of a number, such as 8% of 5,000, using decimals. We change the word "of" into multiplication and the percent into a decimal. Then you just multiply using a calculator, mental math, or paper & pencil. What percentage / How many percent? To answer these kinds of questions (How many percent?/What percentage? ), first write the PART being asked. You can replace the question in the problem with, "What part...?" Write that as a fraction. THEN, simply convert that fraction into a decimal and on into a percent. These two video lessons give examples and full solutions to several basic percentage word problems, most of which involve the concept of PART/TOTAL = PERCENTAGE. First I present three problems that all involve a discount. The first asks for the discount percentage, the second for the discount price, and the third for the original price. Then I also solve a problem where the original price and a percentage price increase are given, and the new price is asked. In the second video, we first find what percentage the area of one triangle is of the are of the other. Of course, to find the percentage, we simply write the fraction PART/TOTAL, and then convert that to a percentage. Then we solve a problem involving an overtime pay that is 160% of the normal. The last problem states, "3.1 is 14% of what number?" — a typical algebra textbook problem. Essentially, we need to find the TOTAL when the part and the percentage are known. One way to do that is to use the little "formula" PART/TOTAL = PERCENTAGE. In this case, we get 3.1/x = 0.14 or 3.1/x = 14/100, and it's easy to solve the latter equation with cross-multiplying. I show how to calculate the final price when you know the sales tax percentage. I show a few examples of using mental math and a few to be done with a calculator. I also show how to make this into a single calculation instead of first calculating the tax and then adding (which is two calculations). This is a beginner lesson explaining how to calculate the percentage of change. We simply find the actual DIFFERENCE between the original and the new quantities, and divide that by the original quantity. In other words, we write the fraction DIFFERENCE/ORIGINAL, or compare the actual change to the original amount. Then all you do is write that fraction as a percentage (possibly first changing it to a decimal with a calculator, and then from a decimal to a percentage). I solve two word problems that involve percentage change - one having to do with percentage increase in area, and another with two separate discounts. All we need to do is write the fraction DIFFERENCE/REFERENCE and then convert that into a percentage. The "difference" is the difference between the two values we are comparing. The reference value could be one of the two values, if it is clear that we are comparing one item to the other. For example, if the question is how many percent taller is the oak tree than a birch tree, then the comparison is TO the birch tree so its height is the reference value. If it's not clear which of the two is the "reference item", then you can use the average of the two values as the reference value. However, this last situation is not deal with in the video.